In addition to the growing trade deficit with China, one complaint the West has with China is the protection of intellectual property. Analysis from the St. Louis Fed shows that the situation is improving. 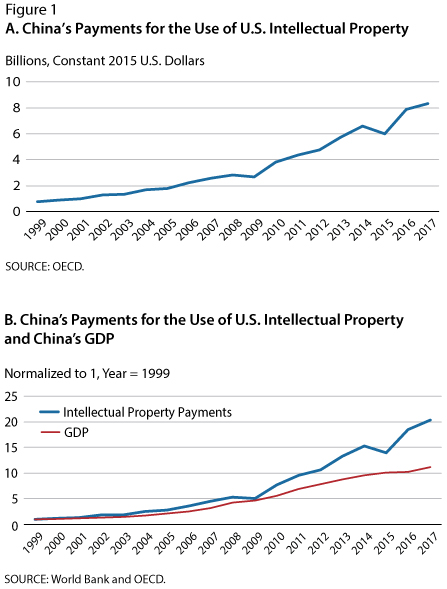 Chinese payment for the use of US IP has been steadily rising over the years, and the rate of increase has been higher than China’s GDP. Phillips 66 spokesman Dennis Nuff confirmed Monday that the company is cooperating with the Federal Bureau of Investigation in an case involving a former Bartlesville employee. A Chinese national, Hongjin Tan, who is a legal permanent resident of the United States, was charged last week in Tulsa federal court on a theft of trade secrets complaint, according to federal court documents. Tan is being detained, and preliminary and detention hearing are scheduled Wednesday. The sample looked like an ordinary piece of glass, 4 inches square and transparent on both sides. It’d been packed like the precious specimen its inventor, Adam Khan, believed it to be—placed on wax paper, nestled in a tray lined with silicon gel, enclosed in a plastic case, surrounded by air bags, sealed in a cardboard box—and then sent for testing to a laboratory in San Diego owned by Huawei Technologies Co. But when the sample came back last August, months late and badly damaged, Khan knew something was terribly wrong. Was the Chinese company trying to steal his technology? Like all inventors, Khan was paranoid about knockoffs. Even so, he was caught by surprise when Huawei, a potential customer, began to behave suspiciously after receiving the meticulously packed sample. Khan was more surprised when the U.S. Federal Bureau of Investigation drafted him and Akhan’s chief operations officer, Carl Shurboff, as participants in its investigation of Huawei. The FBI asked them to travel to Las Vegas and conduct a meeting with Huawei representatives at last month’s Consumer Electronics Show. Shurboff was outfitted with surveillance devices and recorded the conversation while a Bloomberg Businessweek reporter watched from safe distance. This investigation, which hasn’t previously been made public, is separate from the recently announced grand jury indictments against Huawei. On Jan. 28, federal prosecutors in Brooklyn charged the company and its chief financial officer, Meng Wanzhou, with multiple counts of fraud and conspiracy. In a separate case, prosecutors in Seattle charged Huawei with theft of trade secrets, conspiracy, and obstruction of justice, claiming that one of its employees stole a part from a robot, known as Tappy, at a T-Mobile US Inc. facility in Bellevue, Wash. “These charges lay bare Huawei’s alleged blatant disregard for the laws of our country and standard global business practices,” Christopher Wray, the FBI director, said in a press release accompanying the Jan. 28 indictments. “Today should serve as a warning that we will not tolerate businesses that violate our laws, obstruct justice, or jeopardize national and economic well-being.” Huawei has denied the charges. For Americans, how do they resolve these differences, and what should the proper policy response be? This conundrum is reminiscent of debates over Fed policy. If an excessively easy monetary policy designed to cushion the economy from the effects of the Great Financial Crisis raises the risk of creating an asset price bubble, what should the Fed do? One option is to raise rates, which chokes off growth, but minimizes bubbles. In the last few years, the Fed has chosen to eschew the use of interest rate policy, which it believes to be an overly blunt instrument, and rely on macro prudential lending policy as a way of combating asset bubbles. Here is how the Art of the Deal meets the Art of the Possible. These cases of intellectual property theft are specific in nature, and occur on American soil, rather than in China. Trade policy is an overly blunt instrument, and these cases can be dealt with by existing agencies, such as the FBI. Trump also raised the issue of “real structural reform” in his State of the Union address. What does that actually mean, and can these problems be addressed by the March 1 deadline? Imagine Chinese officials demand that the US government withdraws from the housing market, where through its ownership of Fannie Mae and Freddie Mac, it nationalized America’s mortgage lending. Imagine Chinese officials complained when the US injected capital into all the large banks whether they asked for it or not. In other words, if the US is demanding the kinds of structural reforms that it proposes by March 1 deadline, it is in effect making an ultimatum that cannot be met, and the demands represent a fig leaf for what amounts to the declaration of a full-blown trade war. Why bother negotiating when you know the other side cannot yield to your terms? The WSJ reported that a wave of farm bankruptcies is already sweeping America’s farm country. To be sure, the bankruptcies cannot be all attributable to the trade war, as commodity prices have been depressed. The Midwest represents the heartland of Republican support. and both Trump and Congressional Republicans will have to face the voters next year. Are these demands about structural reforms a form of posturing, or is Trump serious enough to go over the cliff if they are not met? Moreover, Trump has made it clear he is enthusiastic about a summit with Kim Jong-Un of North Korea, which is a country that China has considerable leverage over. How susceptible is he to Xi Jinping playing the North Korea card? Here is another instance where the Art of the Deal meets the art of the possible. Expect either the March 1 deadline to be extended, or a deal to be made where both sides commit to further discussions on intellectual property protection and structural reforms. Despite all of the rhetoric about how the two sides are still far apart, and no Trump-Xi meeting is scheduled, a sliver of daylight is appearing in the negotiations. Axios reported Sunday that the US side has floated a trial balloon of a Mar-A-Lago location for a summit instead of China`s proposal of a Chinese location. Xi may soon come to Mar-a-Lago. President Trump’s advisers have informally discussed holding a summit there next month with Chinese President Xi Jinping to try to end the U.S.-China trade war, according to two administration officials with direct knowledge of the internal discussions. Both officials, who are not authorized to discuss the deliberations, described Trump’s club in Palm Beach, Florida, as the “likely” location for the leaders’ next meeting, but stressed that nothing is set. The meeting could come as soon as mid-March, these sources said. A third official cautioned that the team has discussed other locations, including Beijing, and that it’s premature to say where they’ll meet or even whether a meeting is certain to happen. Everybody wins. The Trump administration demonstrates a mastery of the Art of the Deal. China can temporarily take the tail-risk of additional tariffs and trade war off the table. When Apple announced their 20% decline in China phone sales, they talked of weak consumer spending. I said it was consumer nationalism against America. Well Huawei just announced over 20% GROWTH in sales for the same quarter. I rest my case. Nobody wants to talk about this for fear it becomes a media self-feeding meme. But American international brands must be worried. Starting to see some major red flags now in my smart money sentiment indicators… we found still grind up into 2800, but IMHO the easy money has been made in this rally from the 12/26 low. I am taking profit on long positions here and may be looking to play the short side again soon. Expecting a 4-5% pullback to commence from an IT top that should be forming over the coming days. May I ask where I can find the smart money sentiment indicator ? It’s my own proprietary options based sentiment indicator. I have a short position now and am looking to add on any rallies. My analysis suggest R/R strongly in favor of bears here with 1% upside vs. 4% downside expectation.